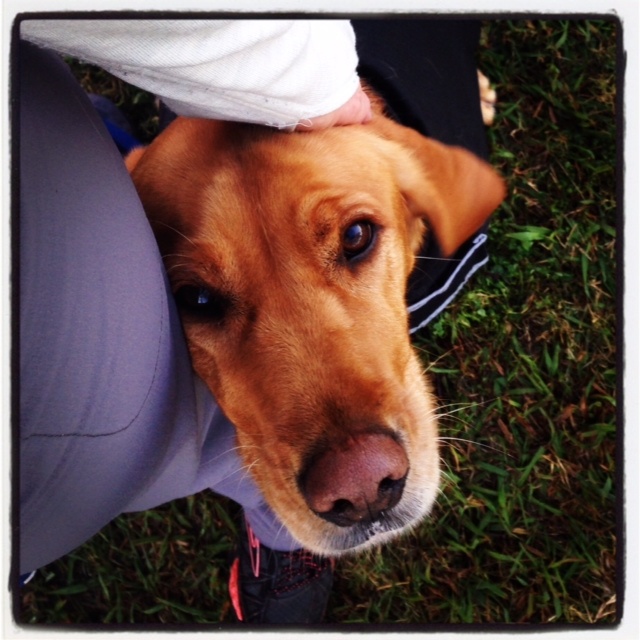 Dog Blog & Marketing Monday – Am I a Journalist or a Media Channel? Mum’s been involved in a couple of online conversations recently on the topic of what bloggers should get paid. So while our little blog here isn’t commercial, instead it is just our little place to capture our stories, thoughts and learnings, but it’s not to say one day it won’t be and mum has a pretty clear view on what commercial looks like. So we thought we would give Foodie Friday a theme for the next few weeks… Well 26 weeks if all goes to plan. Yep we are going to work our way through the alphabet with a Foodie Friday treat or food fact each week. Let’s start with A… A logical place to start… Like the start of an agility course really which is why I get confused at the start of Strat Pairs when mum walks me out to the middle of a course… Anyway back to A. 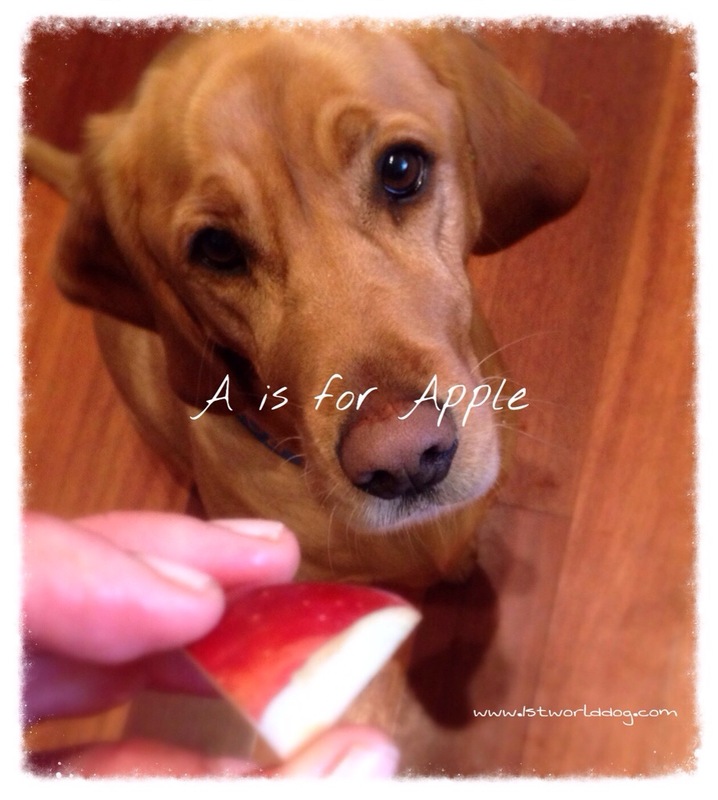 A is for Apple. A super easy and handy treat. Readily available in our house as Toddler often starts an apple and just ears all around the outside and then hands it back to mum. Rather than waste it mum then cuts it up into little cubes (1-2cm in size) and they are perfect little treats for training. Besides tasting good they are also full of Vit C and K as well as Calcium. There are a couple of watch outs though with the good ol’ Apple. The first is timing. You know the deal… They can go brown and yucky pretty quickly. Better when fed immediately… A perfect excuse to practice some watching backwards around the house. Apple seeds aren’t so good. Seeds contain cyanide which can cause an upset tummy and in large quantities can cause serious issues. No apple cores please. Along with the core another watch out is whole apples being a choking hazard . So the best bet is to chop up the apple into perfect treat size pieces and enjoy the fun. So if you are a regular reader of my little blog here you probably know mum has had a couple of pre-occupations lately… getting my bum over bars and more recently start line stays. So after taking in lots of advice we put it into practice at the weekend trial and couldn’t be happier with the result… so here is a summary of what we learnt. Now let’s go back to the start… Start line stays that is. When we started out in agility I had a pretty decent start line stay. Then late last year I decided I didn’t like the idea of waiting and so starts became chaos. Mum would hold my collar as she removed my lead and handed it to the steward. Then mum would say ‘stay’ but the moment she let go of my collar I would bolt. We have written about before in the blog that we don’t know what we don’t know. There were also things that we were exposed to in our earlier days of training that we didn’t really understand the why? behind them and the importance of them. This is especially the case in agility. One such thing we have learnt more about is contacts. Marketing Monday – Who is the audience? As bloggers we obviously think of our readers first and foremost as our audience….ok maybe my fellow canine aren’t the best readers but their wonderful owners. Through tools like google analytics we learn some basic stuff about them (where they live and when they are not out walking and playing with us dogs and reading stuff online). Through the comments they leave on our blogs and other social media we learn more about their likes, dislikes and attitudes on things (hopefully important stuff like favourite dogtreats to make). All very valuable and depending on why you blog these may be things you use to help shape the style, content and voice of your blog. Happy Mother’s Day Mum… I did the tough stuff. Have to love it that mum moved Mother’s Day in our family yesterday so we could go to an agility trial at the Hawkesbury Agriculture Show. Well we are at at the end of We Live In A Flat’s 12 week app photo challenge and we have learnt SO much. You can check out what we have learnt over the last 11 weeks ion my Photo Challenge page or see more detailed descriptions of the apps on Mrs P and Donna’s page. I’m borrowing this week’s Marketing Monday from a friend because it is a good read. Steve is a friend of mums and someone she finds inspirational person to have coffee with when she is in Melbourne. This post on his Start Up blog chats about what we learn in formal schooling versus our own choices in vocational learning and life experiences. The start of this year there have been lots of a-ha moments of mum discovering so much foundation work that can and should be done for agility. As the 1st dog that mum has been doing agility with this whole thing is a big learning curve for both of us. We are loving having this blog as our learning journal to capture and we have just had a wonderful thing messaged from Zsofi Biro over in Hungry…. Chatting about doing agility foundation work regardless of the dog’s age she said “exploring should take a lifetime! that’s when they (the dog) feel they are important, if you keep their lives exciting!”. What a fantastic way to think about doing any sort of training be it Agility, Obedience, Rally O, Tracking, Dancing and just tricks around the house…. making us dogs feel important. Is that not a reason to go have some fun learning some new tricks.